This large strong horse carried medieval knights into battle. It was hardy, courageous, powerful, and quick to respond to the rider's commands. The Spanish brought them to the New Worlds, where these superb warhorses were used by the Conquistadors. In the early eighth century, Europeans were threatened by the Moors to the south and the Turks to the east. 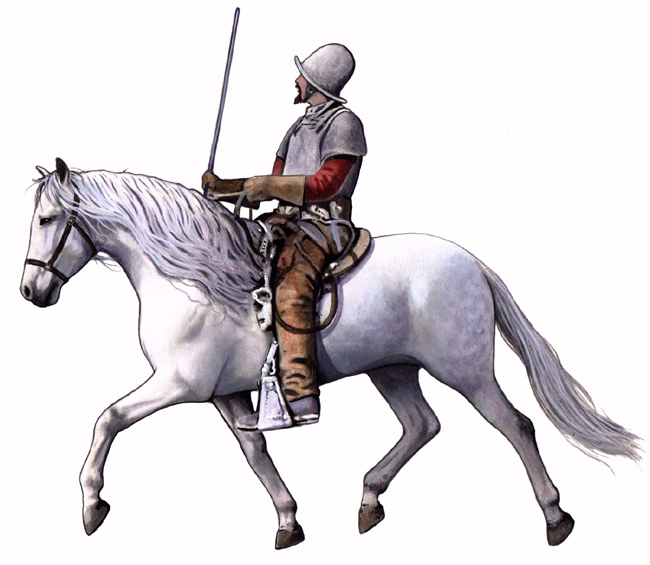 As Islamic forces advanced into Spain and France from North Africa on their Barb horses, Europeans were faced with a horse unsurpassed in combat: hardy, courageous, powerful, quick to respond to the rider's commands, with an uncanny ability to engage its hind end and strike out in any direction. Confronted with this remarkable, ideal warhorse of the Moorish invaders, Europeans realized the importance of breeding horses for battle. Both the Barbs of North Africa and the indigenous horses of the Iberian Peninsula carried Oriental blood and were of a very similar genetic strain. The Barb which invaded Spain in 711 was small, agile, and fiery and possessed great stamina. When the Moors lost their first battle in 718, the victors were awarded the invaluable prize of Barb breeding stock. It was not until the year 1492 that the 'Reconquista' or reclaiming of Al-Andalus was complete. Through the centuries of conquests and defeats, the Barb horse became a great legacy of the Moorish invasions. The Norman invasion of England in 1066 was carried out by fierce warriors mounted on 'destriers.' The mighty chargers were renowned for their equestrian excellence on the battlefield. Research shows that early Spanish horses influenced the development of the now lost Norman horses of medieval France. Norman horses infused with Barb blood contributed to the equine type which would eventually come to be known as Percheron, after the Le Perche district of France. Percherons imported to the U.S. in the 1840's were called Normans.